Why not more unapproved music to start off? Here’s The Distance by Cake. Today we’re returning to Training Faithful Women, a handbook about women’s ministry. Part 1 is here. Let’s look at reason number 4 for starting a “faithful women” ministry. 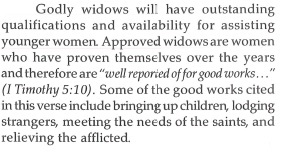 But wait; these widows have spent years earning these qualifications (by bringing up children, lodging strangers, meeting needs and helping the afflicted), which means they are already actively involved in fulfilling ministry. And how do these ladies manage to have “outstanding” qualifications (meaning they’ve been doing a lot of ministry) and still have “outstanding” availability? I’m just really having difficulty picturing this woman. She’s apparently been heavily involved in church ministry for decades (beginning before she lost her husband, I would assume), but apparently has stopped all ministry recently, which leaves her available to help young ladies. I have to wonder why she’s stopped ministering (and why that’s not a red flag) and why she would suddenly be willing to start again, since you don’t let go of a life-long habit without considerable thought. Why am I making a big deal of this? It’s not heretical. This isn’t teaching that is going to cause problems in your church. But it doesn’t actually make sense. It’s poor, meandering writing that can’t decide where it’s going or what it’s trying to say. It has no logical flow and the writer can’t even manage to keep his focus on the heading he just wrote. As discussed previously, there are literally thousands of resources available on the topic of women’s ministry; given the choice, who would choose this one? Oh my word, this is terrifying. Please remember what these “Scriptural standards and qualifications” are in IBLP world. 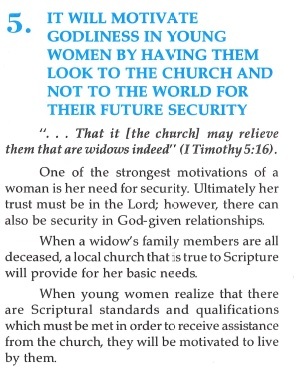 Also remember that Gothard just told us that the church should carry the sole responsibility of caring for a widow without a family. In Gothard’s ideal world, women are made to toe the line because they fear they may starve if they don’t follow the rules. You don’t want to marry this man your father has picked out? You want to go to college? Leave an abusive husband? Send your kids to public school? Not teach the Wisdom booklets? Use birth control? Remember, one of these days, we may be the only people who can help you. And if you don’t live your life according to our rules, we won’t lift a finger. 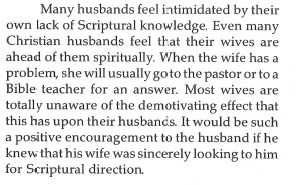 In Gothard’s ideal world, women are bullied and pressured into following the church’s teaching on threat of complete Earthly ruin. How utterly horrifying. That’s…wait…what? Isn’t that supposed to work…like…exactly the opposite way? I thought leaders inspired people, who then followed them. Where does this idea come from, and how the heck does Gothard get away with making a statement like this with nothing to back it up? You really have to wonder why these guys are supposed to be the leaders. Apparently they can’t lead if they don’t first have followers, and their egos are so fragile they can’t handle their wife asking other people questions. Gothard isn’t describing a husband; he’s describing an insecure 13 year old kid. Ahh…there’s so many things wrong with this that it’s hard to know where to start. First of all, this is not how any healthy relationship works. No matter who you are married to, there is always going to be something that your spouse is better at than you, and things you are better at than your spouse. This is a good thing. You’re supposed to complement each other. You’re supposed to arrange your life in a way that makes the best use of both partners’ strengths, and allows each partner to cover for their spouse’s weaknesses. Marriage is not an ego trip for the man. If his wife knows more about the Scriptures than he does, he needs to recognize that and get over himself. If he wants to know more about the Bible, maybe a great start would be learning from his wife. Second, this teaching undermines one of the most important roles of the body of Christ, namely, supporting and helping Christian families. You must be aware of a need to meet it, and telling women not to ask questions at church ties the hands of the church. How is a pastor to appropriately instruct his congregation if half of them aren’t allowed to even ask him questions? Thirdly (and perhaps most scarily), this is yet another door of escape that is being closed for a woman in an abusive relationship. Not only is she not allowed to talk to the pastor about anything personal, she is not allowed to ask anyone except her husband any questions about the Scriptures. This would include the question “What does the Bible say about leaving a man who hits you?” Further tying the hands of women in these horrible situations is a grave, grave sin. What insane pressure to place on a brand new Christian! In the hands of an abuser, Gothard’s teachings on authority and male leadership are extremely dangerous. But even in the hands of a compassionate, loving husband, they are still a heavy, crushing burden.